One of my many beer related stops this week was at Henniker Brewing in Henniker, NH. Not sure I had ever been to Henniker before Thursday but it was well worth the trip. I spent about an hour with owner David Currier and some time with brewer James Moriarty. The brewery is in a beautiful building at the end of a short dead end road. The facility was formerly occupied by as a medical supplies distribution center so it has all the necessary space, loading docks, etc. They have turned one large area into the brewery with a huge walk-in cooler and area for a tasting room and retail area. There is also A LOT of office space for the staff. Unlike many new breweries that start with a 1, 3 or 7 barrel system they are starting with a 15-barrel system, 3-15 barrel fermenters, 1-30 barrel fermenter and 2-30 barrel bright tanks. They also purchased a bottling line that will fill both 12 and 22 ounce bottles. 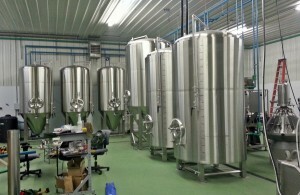 This is a very nice setup for a start up brewery. Head brewer James Moriarty comes to Henniker from Cape Cod Brewing and was very excited with the progress being made in the installation. More details on the brewery are below – be sure to check out their website, like them on Facebook and follow them on Twitter.